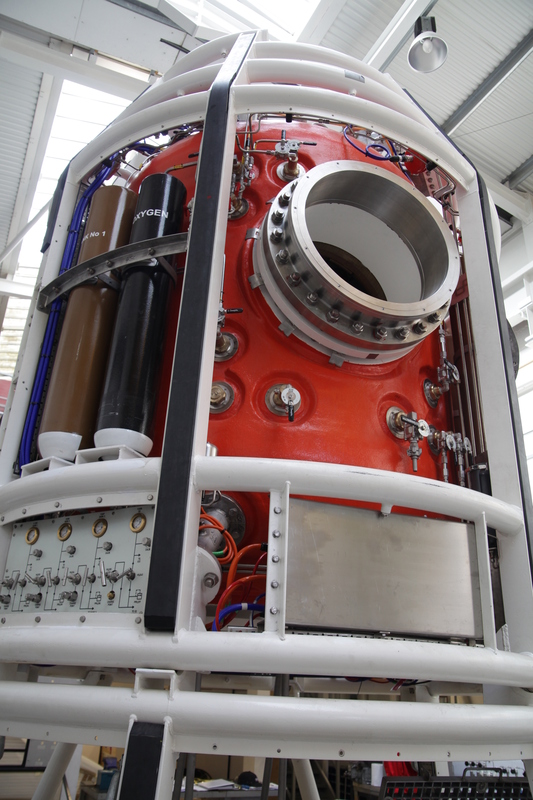 JFD offer a flexible range of designs of 12, 18 and 24-man saturation systems for integration into new diving support vessels. 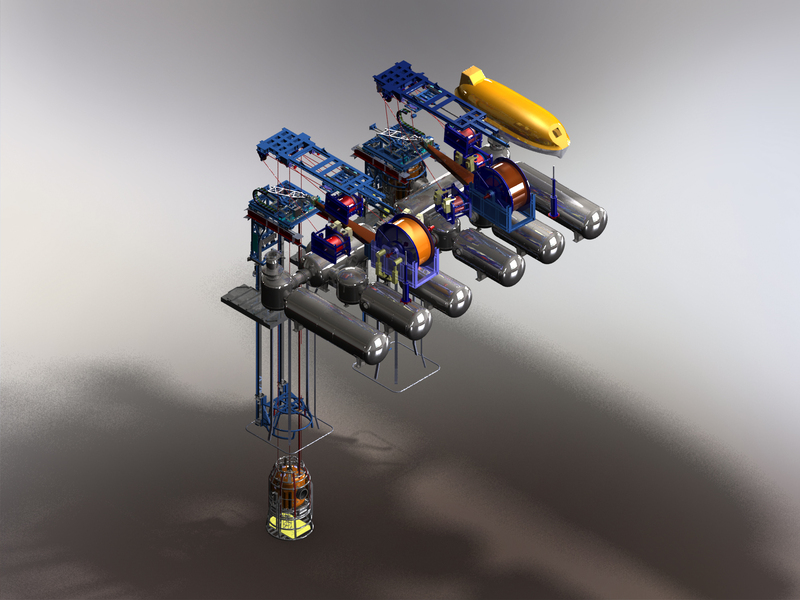 Recent JFD integrated systems have been design-approved and classified by Lloyds Register and DNV and can be offered with full compliance to NORSOK for operations in the Norwegian sector. 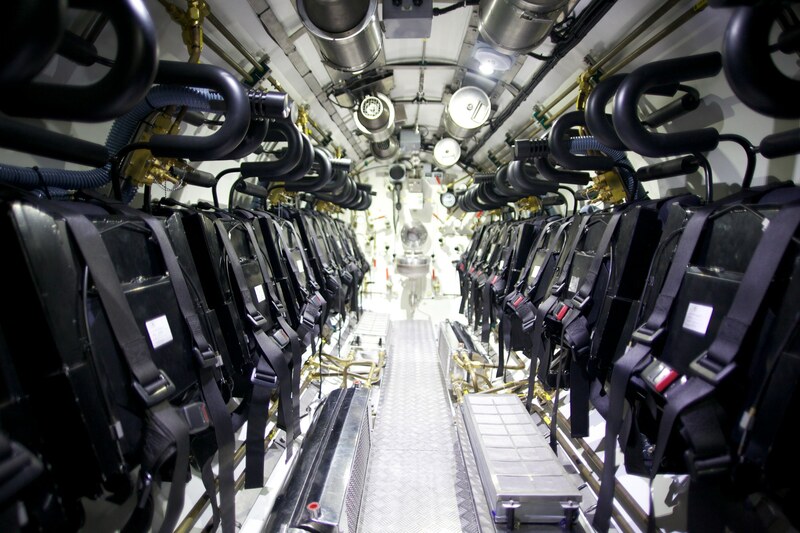 JFD integrated saturation diving systems represent state-of-the-art technology. Recent innovations and the adaptation of existing technologies for diving applications have resulted in significant operational advantages, and allow operators to continue working in sea states which would previously have seen the suspension of diving. The systems provide a much more comfortable, quieter and safer environment for the divers than previous generations of systems, and this contributes greatly to diver efficiency. 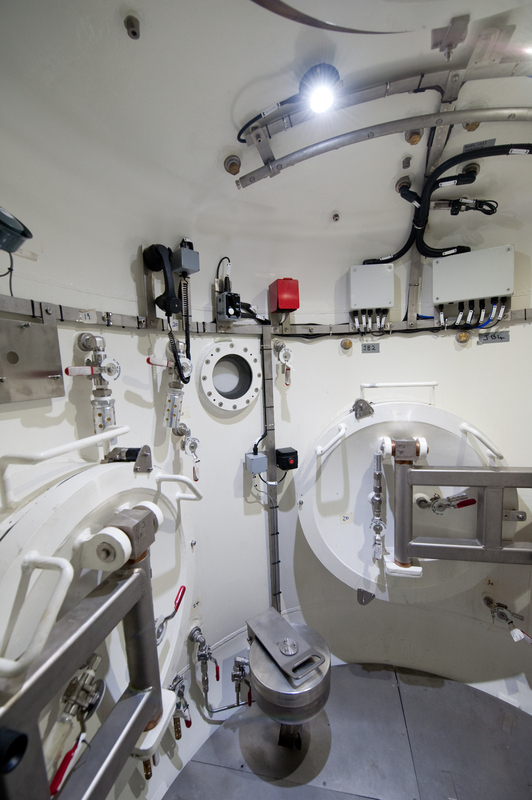 The JFD integrated saturation system living and decompression chambers are designed to optimise space and provide a safe and comfortable environment for the divers. Each diver has their own private sleeping berth with independent ventilation, communications and entertainment. Particular attention has been paid to the sound and light isolation between each divers bunk. Dimmable bright white LED lighting systems are fitted within the chambers and each diver has their own controllable wand light inspired from business class aircraft seating. 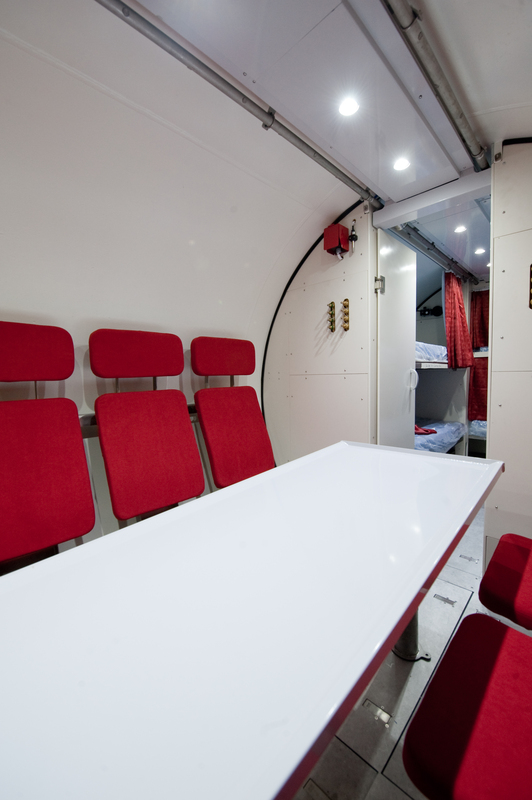 Each living and decompression chamber has its own entry lock which provides an ‘en suite’ toilet and washing facilities, but most importantly provides a ‘safe haven’ which will always be at the same depth for emergency evacuation. Reversed intermediate dished heads eliminate the usual corrosion trap in the wet entry lock. For twin lock chambers we either employ separate medical entry locks integrally welded to the horizontal main lock, or we reverse the intermediate dished head to eliminate the usual corrosion trap in the wet entry lock. The internal and external gas recirculation systems ensure perfect mixing to eliminate layering while reducing noise, and each bunk are has its own ventilation. Penetrations are grouped in one area to ease emergency isolation and maintenance access. The chambers are of horizontal format of 2.4m diameter to maximise the ergonomic arrangement. Internal outfitting equipment includes DH21 scrubbers and emergency heaters, ultralite 2 BIBS masks, LP-20 lights and LED bunk lights. 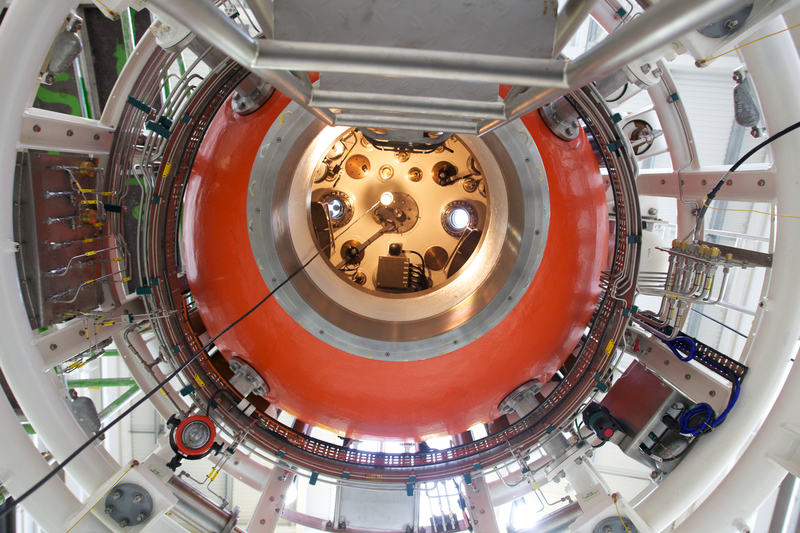 Control of the deck decompression chamber (DDC) will take place on the same deck as the chambers themselves. 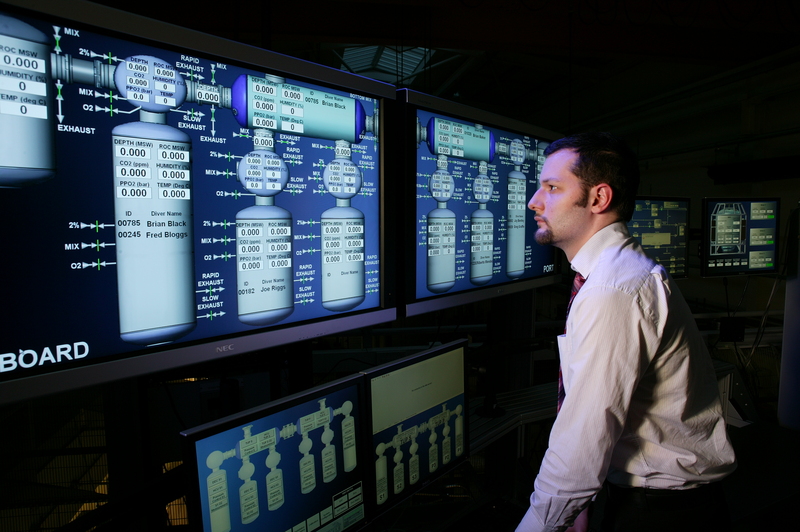 The control system can be fully automated or use a conventional direct control approach. The chamber control system is fitted with 0.25% accurate large format digital depth displays for each system lock, and incoming HP gas regulator panel, gas analysis panel and electrical control panel. 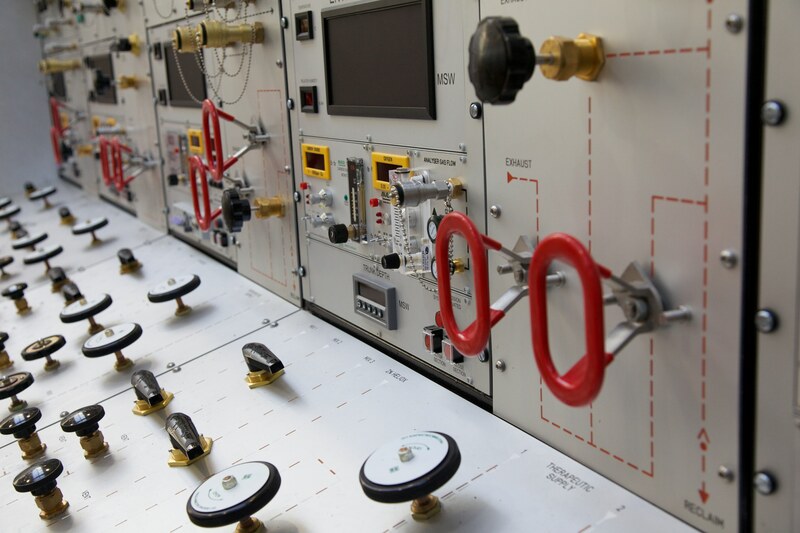 Mix 1 and 2, heliox, helium, oxygen and therapeutic gas are supplied in each section of the DDC control panel. Standard Analox G22 (O2) and G30 (CO2) analysers are located in a central analysis rack in chamber control. 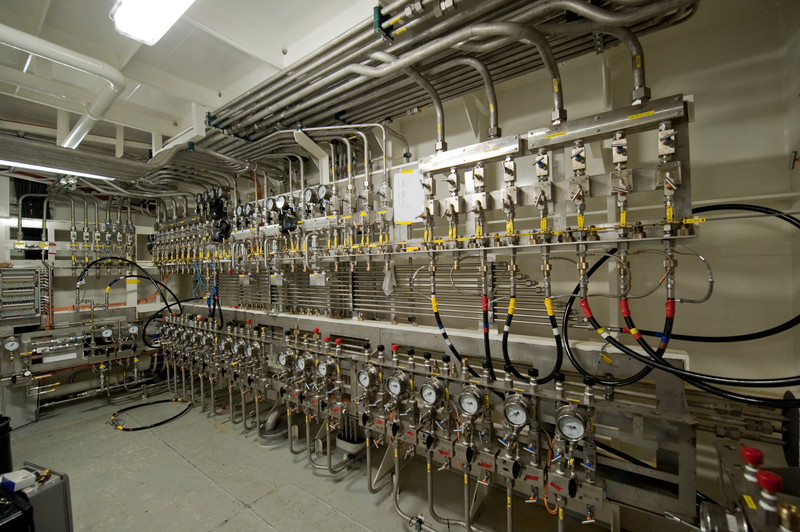 The gas sample lines from each chamber are run to the analysis rack and are manually selected to monitor the relevant chamber compartment. The diver communications uses the latest digital Divex HeliComTM unscramblers. Real-time audio/video monitoring will be held on hard disc with re-writable DVD recording. 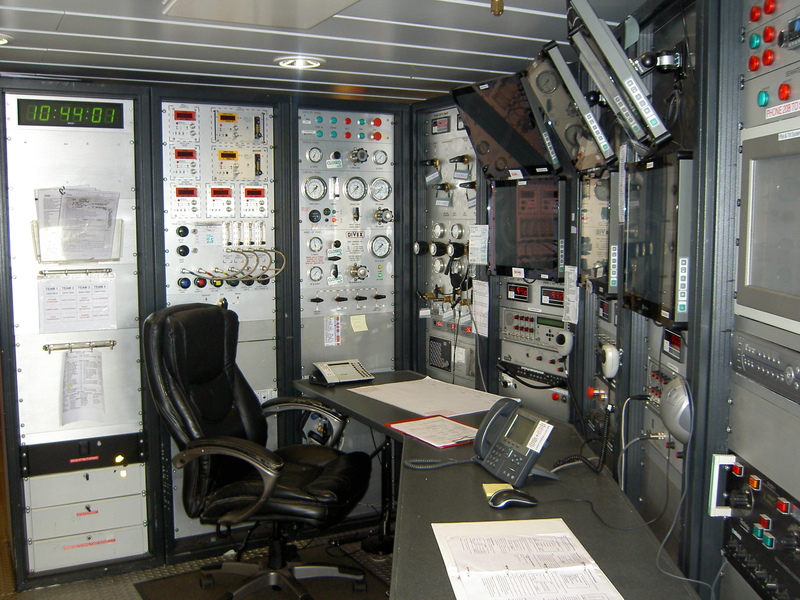 Each dive control console can be built using either electronic, touch-screen control or conventional direct control technology, and the console layout will meet the latest ergonomic thinking which places the most commonly used video monitors in front of the supervisor, along with key operating information such as alarms and depth displays. These bring together all the information and control functions required to safely and effectively manage the submersible decompression chamber (SDC) operations. This will include provisions of a screen space built into the console for project information such as crane data (screen and data supplied by client). Final Layout will be determined in close consultation with client user groups. Diver video and diver communications are continuously recorded directly to hard disk and to DVD-HDD. Diver video can be fed to external viewing and recording systems via matrix switching, supplied as an integral part of the system. Each LARS console is located within the dive control room with direct vision over the TUP mate flanges and moon pools. 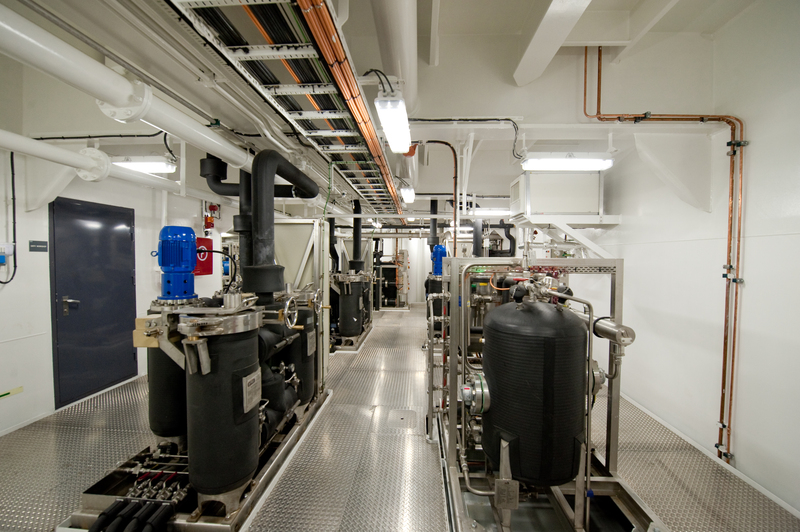 Located typically in a lower deck on the vessel, the gas management system ensures optimised use and reprocessing of the expensive divers helium and oxygen breathing mixes. 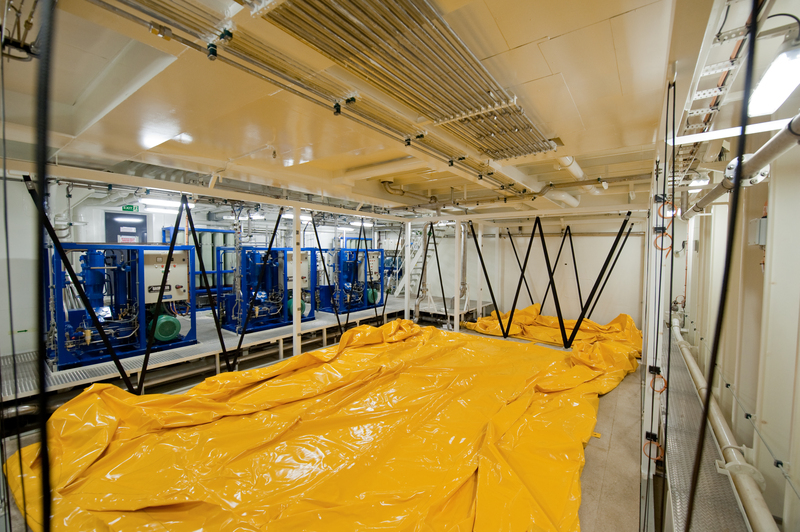 The divers breathing gases are continuously monitored using the saturation control room analysis suite. 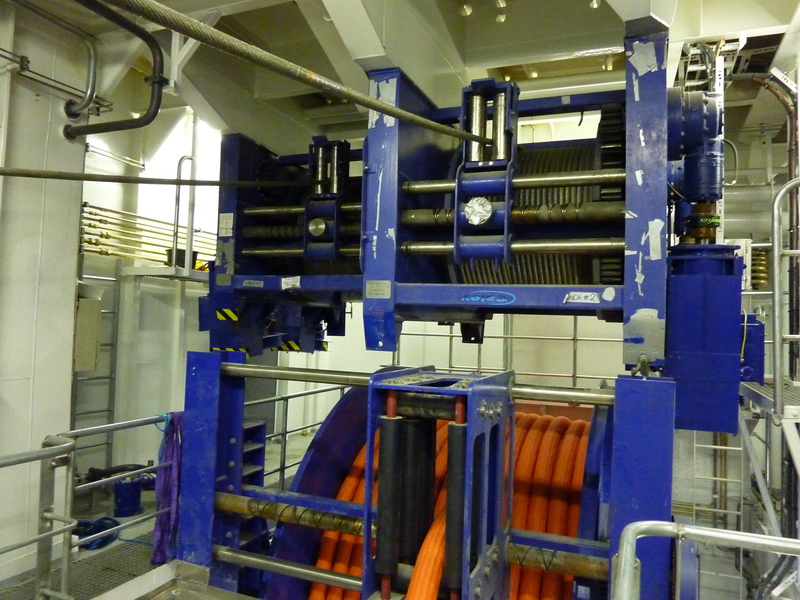 The submersible decompression chamber (SDC) LARS uses electric winches to minimise power consumption and operating noise. 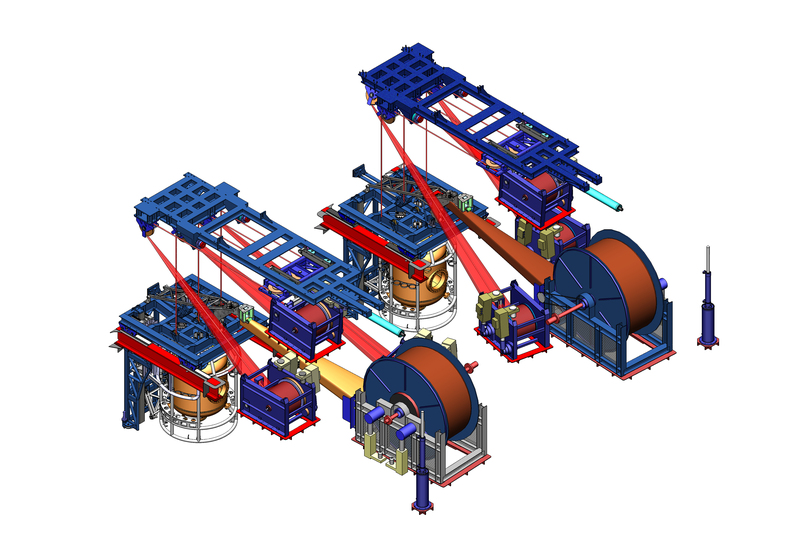 The main winch is designed for handling the SDC through a moon pool using an overhead trolley, with a passive cursor running down moon pool rails (typically supplied by the shipyard). The system is designed to operate in sea states up to 4m Hs for headings within 30o of head seas and subject to the actual accelerations imposed by the vessel response. There is no heave compensation but shock absorbers are integrated into both the SDC lift and guide wire lift systems. The guide wire system can also recover the SDC in the event of failure of its lift winch. A synchronised, constant tension umbilical winch automatically deploys and recovers the umbilical to follow the motion of the SDC. An external approach has been adopted for control of the environment within the chambers. This reduces clutter within the chambers to maximise living conditions and aids cleaning and bacteria control. 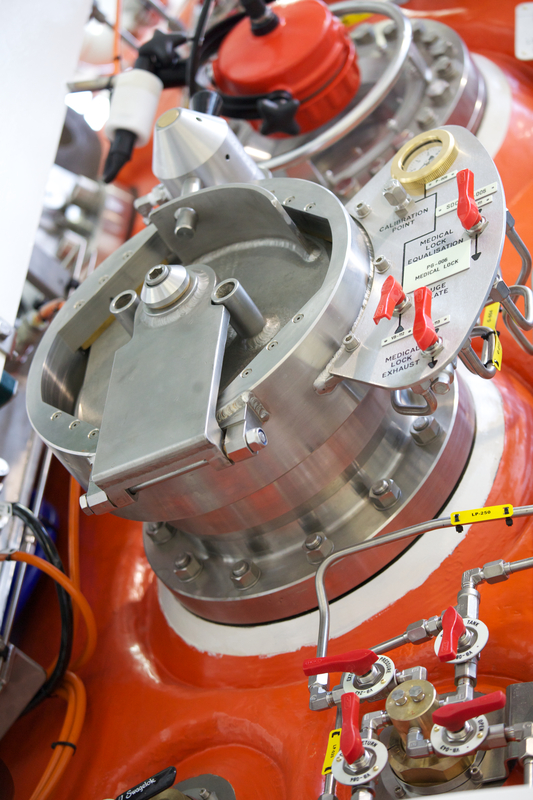 Each twin lock chamber and the adjoining TUP is provided with a dedicated HCU-ER (Hyperbaric conditioning unit – external regeneration) which removes CO2 and water vapour and controls the lock temperature and humidity. 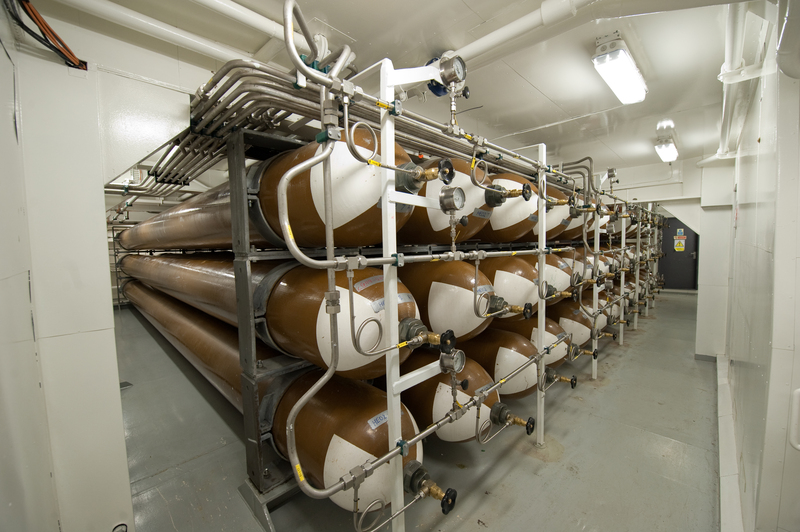 Each HCU-ER is supplied with the required heated and chilled water from its own HCS-1. Cooling water provided by the vessel must come from two totally independent sources. An additional HCS-1 will provide back up for any complete HCS-1 failure. The PWS-01 potable water system provides a simple, reliable, fully automatic self-contained source of hot and cold domestic water for saturation diving systems. Divers hot water is provided by the Kinergetics WHE-3 heaters, which provide hot water for the divers operating from the submersible diving chamber (SDC). Each provides a safe, reliable and inexpensive solution for automatically controlled dive system hot water. It features a new 24 volt control circuit and provides consistently accurate and reliable temperature control ±1°C of set point by means of a simple temperature modulating valve and controller. JFD submersible diving chambers (SDC) are designed to deploy 3 divers, with diver one and two’s umbilical’s housed within the SDC. They are also designed to withstand both internal and external pressure to 300 MSW and has a design temperature of -18 deg to +66 deg. With two standard designs of either 6m3 (Ø9m) or 7m3 (Ø2.0m) bottom doors are all Ø800mm. Available in side mate or bottom mate design and typically with double acting bayonet doors. Each SDC is of “sinker” design without releasable ballast or attachment points. Divex has an approved tertiary recovery method back to the TUP to provide a truly independent emergency recovery without resorting to buoyant ascent. This does involve the use of the ships crane, light work class ROV and ROV hot stab emergency umbilical. The bottom door is a double acting castellated design with hydraulic actuation. The bell is equipped with a Mara 3-diver distribution panel for diver gas supply, DH21 Heaters and scrubbers for emergency life support, and LP-20 lights. Externally the SDC is fitted with a Divex emergency battery pack and Aquabeam 500w external lighting. JFD integrated saturation diving systems utilise self-propelled hyperbaric lifeboats (SPHL) as a means of hyperbaric diver evacuation. These fully comply with SOLAS and DNV requirements and conform to IMCA standards. The SPHL accommodates all the divers in the system and is crewed by a coxswain and life support technician. The remote control requirement of the SPHL is integrated within the chamber control console. 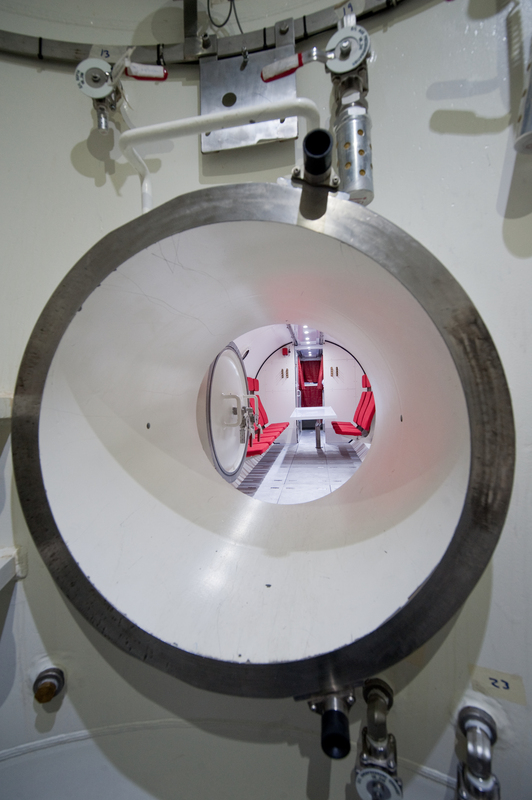 The interface to the hyperbaric lifeboat (HLB) is via a short umbilical fitted with QCs. An escape trunk complete with clamps is also provided as part of the system. This connects to the TUP outboard lock. The trunk is provided with through-deck sealing flanges to interface to the deck coaming arrangement. The SPHL davit is mounted on the ship’s side structure and uses a ‘Dead ship’ stored energy system for autonomous deployment. JFD manufactures a range of SPHLs to suit client requirements, click here to see our full range.